If total sensory overload is the purpose of any good blogging conference, then BlogHer Food last weekend in Austin can be declared a raging success. In fact, I think it will probably take the next few weeks for me to totally absorb it all. My synopsis right now is that there was just SO MUCH to take in. For now, I’ll just say that I met some truly fabulous people (both bloggers and sponsors), picked up great tips on food writing & photography, and basically had the time of my life. Hopefully, you will start to see some of that information reflected in future posts, but for now I’m going to focus on some of the events I attended. Here is but a fraction of last weekend’s activities. The party on the roof at Whole Food’s flagship store was fun, blazing hot and super windy but the food provided by local chefs was fabulous and the people were warm & friendly. One stand-out was Becker Vineyards (including Richard Shelton, Assistant Winemaker & Enologist) who took the time to really speak to us about the wines and the science behind them. Do I remember all the chemistry mentioned? No, I do not. But I can tell you that Richard loves what he does and it shows in the wine. We sampled a Claret, Viognier, and rosy Provencal – all of which were spectacular. 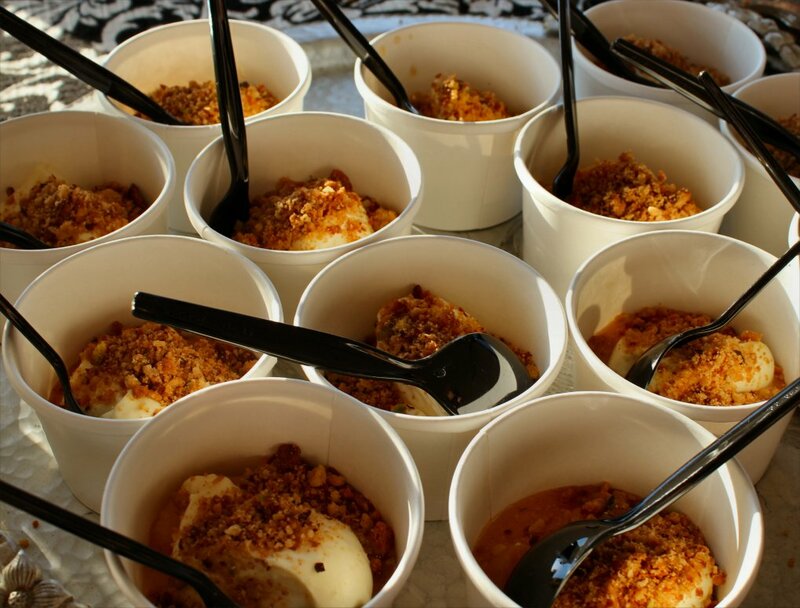 For me, the best bite of the night went to the ladies from Foreign & Domestic (including chef & co-owner Jodi Elliott), who put together a creamy custard parfait topped with peaches, honey, thyme & a graham cracker crumble. So simple, yet rich and bursting with peach flavor. It was amazing. Foreign & Domestic’s Peach Parfait – I could have eaten the entire tray! To see more great photos from this event, click here. Between sessions on food writing, photography and social issues, I was fortunate enough to be invited to some truly special off-property events. The first of these was the U.S. 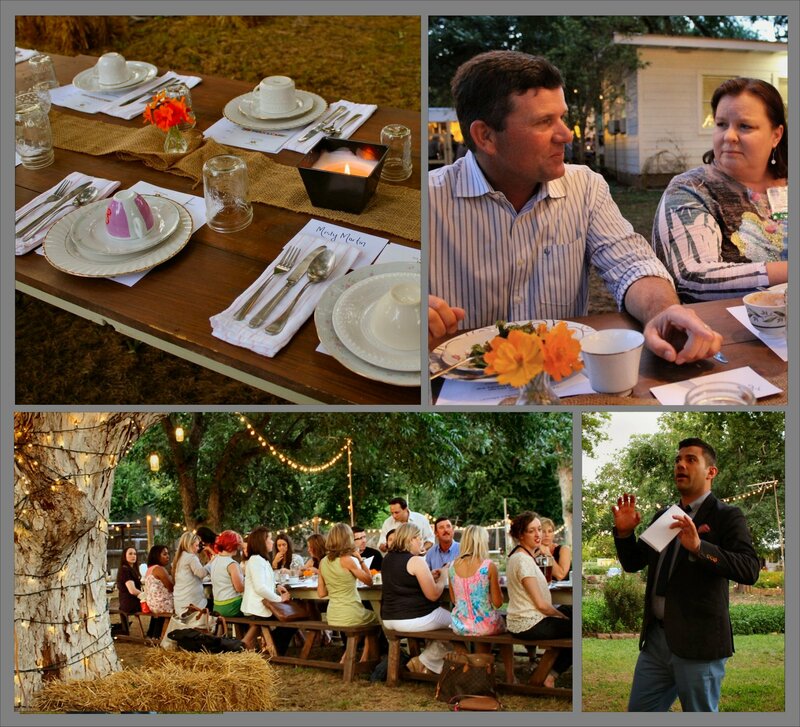 Farmers & Ranchers Dinner held at Springdale Farm in east Austin. Aside from being surprised to find such a large farm inside the city, I was stunned at the oasis they had created. As part of the event, we were treated to a tour of Springdale Farm as well as a dinner with local farmers and ranchers where we were given the opportunity to discuss issues around food sourcing, organic vs non-organic foods, and the importance of supporting local farms and ranches. Our group was fortunate to be paired with Jason Peeler, a cattle rancher from Floresville, Texas who attended with his lovely wife, Marianna. He raises cattle, she raises free-range chickens, and together they raise their children with a focus on quality over quantity. While our conversation became fairly spirited debating corn-fed vs grain-fed beef, Jason was open and honest and made the evening as informative as it was fun. Speaking of fun, our host chef Danny Boome was charming, despite struggling to pull off a Texas drawl with his British accent. A heartfelt thanks to our hosts and owners of Springdale Farm, Glenn & Paula Foore and the U.S. Farmers & Ranchers Alliance. It was a magical evening. Saturday afternoon, I had the pleasure of attending a luncheon with Dole Foods hosted by Susan of Doughmesstic.com. A bus picked us up from the Hilton and whisked us away to a modern mansion in the hills overlooking Austin. The house and views were amazing, but the focus was on Dole’s line of fabulously fresh foods, which were served for lunch. The meal was anchored by last year’s Taste of Dole California Cook-Off contest winner – Island Pork Sliders (so moist & juicy). We were also treated to a cooking demo by Chef Ben Ford, who has again partnered with Dole for this year’s cook-off competition. In a surprising twist, we were treated to a blind tasting of a date-topped appetizer and challenged to name as many ingredients as possible. The blogger who came closest to identifying all of the ingredients would be flown to California in late June to sit on the judges panel for this year’s Dole California Cook-Off. And the winner was…. Liz from The Lemon Bowl. Congratulations, Liz! 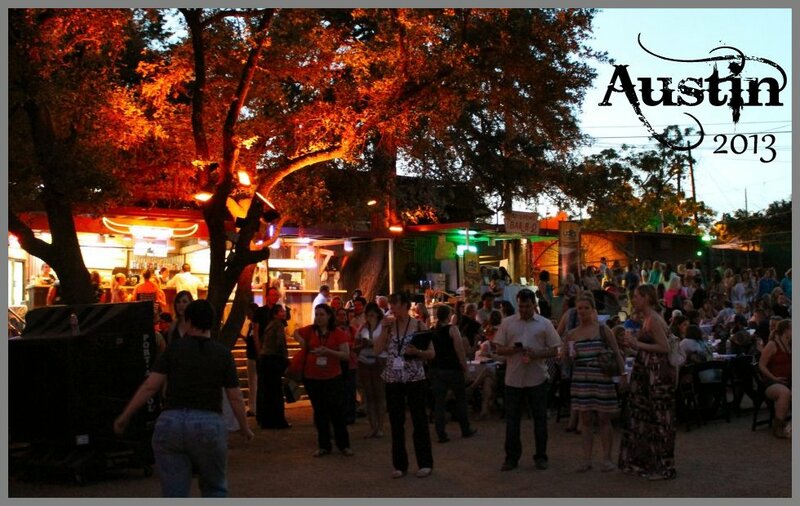 Lastly, the conference was capped with a closing party at Stubb’s Bar-B-Q in downtown Austin, hosted by Ree Drummond (The Pioneer Woman), Jaden Hair (Steamy Kitchen) and Elise Bauer (Simply Recipes). There was barbecue, live music, cold beer and dancing and despite the oppressive heat, a good time was had by all. It was a perfect end to an exhausting but exhilarating weekend. One last peek at the week’s excess: the swag. I’ve heard tales of bloggers coming home from conferences with bags full of freebies from vendors and sponsors, but I really had no idea. No baseline, so to speak. Now that I’ve seen it in action, I am stunned. Here is just a portion of what I received over the weekend. 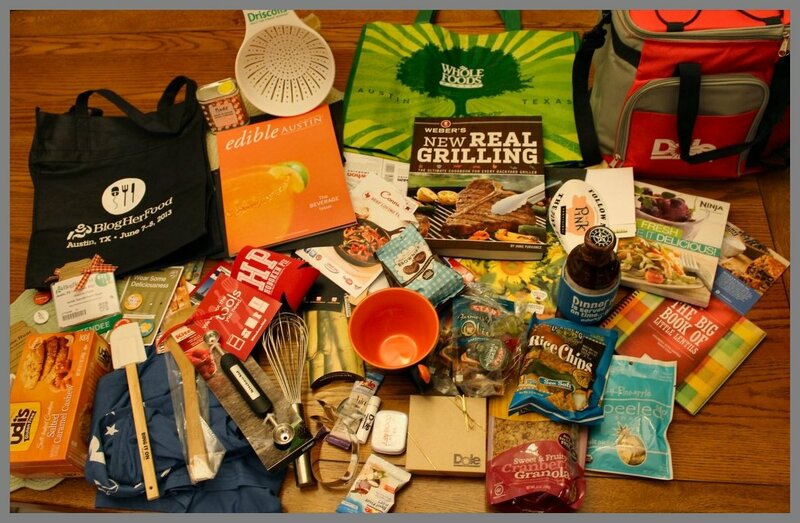 Swag Aftermath – this is only two-thirds of what I received at BlogHerFood. And that’s part of what was left after I gave some away. The most surprising thing is it’s REALLY NICE STUFF! Kitchen utensils, glasses, cookbooks, you name it. There was so much food, I actually gave the valet guys at the hotel a bag of snacks when I checked out. I was one of the lucky ones who drove home. I cannot even begin to imagine trying to get all of this on an airplane. But I guess I’ll have to figure it out because I’ve got the bug now and really hope to attend BlogHerFood again next year, wherever it may be. I figure I’ve got one year to plan, scheme, save & beg… but I think I can do it. Who’s with me?!? One thing is for certain – I can always count on my homegirls! YUP, peach parfait was by far THE BEST. 2. Maybe we can go tour Springdale Farms again, that looks so awesome! I’m still wondering if I can recreate that parfait, or if I should just give up and come to Austin so we can go to Foreign & Domestic and order a full-size serving. If I attempt it, I’ll let you know how it turns out. And YES I would love to plan a trip back to Springdale Farms sometime soon. You would love it. Thanks again for a great weekend, Katie. I enjoyed it! I am so bummed because my wordpress blog isn’t compatible with Blogher. Looks like a great weekend of great food with great foodies! I use WordPress, too! You don’t have to publish with BlogHer to attend the conference. Any food blogger can attend, but space is limited so you have to register early. Maybe I ‘ll see you there in 2014? I would love to meet all my fellow bloggers one of these days! I love the swag at these! Looks like you had fun! There are no words, Thoughtsy! Oh, wait… yes there are – exciting, extreme & exhausting. But totally worth it. We had a blast! So glad that I met you and found out that you are a local Houston blogger. By all accounts it looks like you had a splendid time Jeanne. The photos are fab as is your overview of the weekend. Cheers! I miss all of you, too! You ladies are by far the most fun to hang out with. Can’t wait to do it again! Such a fun conference, wish we could do it all again!! Soon! Me too, Cathy! Now that I’ve slept, I’m ready to do it all over again! It was great to finally meet you in person. Now I just need to get back to Oregon and come visit. So very glad that I got to meet you! And I look forward to getting to know you better! xoxo great re-cap! HOW FUN! I’m so bummed not to have been able to join you guys this time around. I am glad that you got to meet so many old and new blogging friends. I can only imagine the trouble we could get into if *all* of us were together at the same conference. Pretty sure we’d have to pack bail money if we all made it to the same conference! It was a blast, but it would have been more fun with you there. 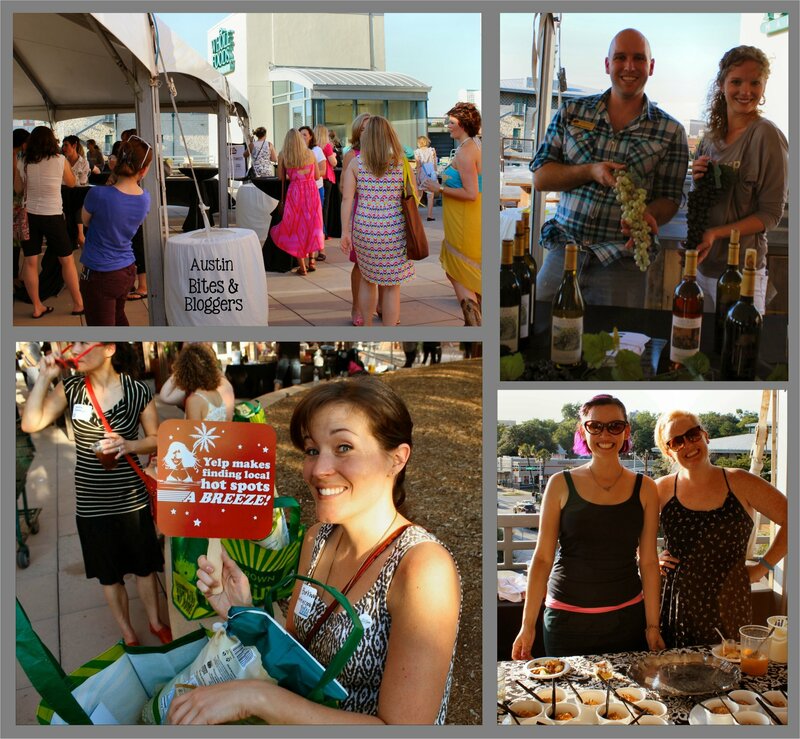 We need to keep any eye out for BlogHerFood 2014 and see where it will be next year! 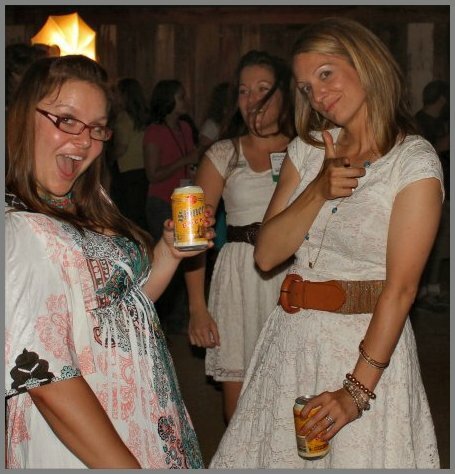 Pingback: Austin Spotlight: Springdale Farm | It's My Blog, Y'All!